We started off by asking why data and analysis is important to Transport for the North. 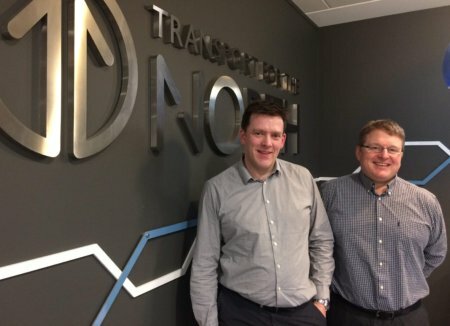 “Transport for the North has a really strong vision of why improving transport is important to the wider economy and I think that’s a message that’s really widely embraced and understood,” Tim explained. “Our job really is to make sure that TfN has the evidence to underpin the arguments that it’s making. That’s both strategic arguments about why these are the right things to do for the North and it’s making the case for investment for specific projects and programmes. Richard: “One of the issues we have is that the current appraisal guidance is more trend based and designed around incremental change, and isn’t really geared up for major step-changes we’re trying to achieve to improve the North’s position within the UK. We pointed out that predicting the future is notoriously unreliable. After all, fifty years ago it was envisioned that we’d all be flying around with space packs now! Tim: “Of course having a long-term plan means TfN needs to recognise that and deal with that uncertainty. To tackle that we’ve been using fore sighting techniques, enabling us to think about different ways in which that future might unfold between now and 2050. Richard: “We’ve already gathered a lot of data and intelligence. And this year is about analysing that and filling in the gaps. “Next year is expected to be more about sharing that evidence, and we can look at other organisations, like Transport for London and Transport Scotland, where data and evidence is shared across a wide spectrum of authorities, not-for-profit organisations, businesses and investors. We’d like to think that by 2019 this sharing will drive great benefits in terms of consistent investment decisions and efficiencies for the whole of the North. “Working within the Analytical Framework we’ll also be taking some of our programmes to another level of detail. As well as looking at the broad long-term investment programme for the North and TfN’s overall portfolio, we’re starting to look at individual schemes and putting evidence together for individual business cases. Richard: “An area we are moving into as well is monitoring. This isn’t just about predicting change that may happen in the future but also changes to transport that are happening now, and measuring the wider transport impacts. For example, with Rail North we have large investments in the Northern and TransPennine rail franchises being delivered over the next couple of years and we want to track the impact those have. “We also have TfN’s Integrated and Smart Ticketing programme, which is rolling out over the next couple of years. Understanding the customer’s experience in the North is a top priority for us. With so much in the media at the moment about how personal data has been mined and used without permission, we asked what is being done to ensure that TfN obtains and uses data in an ethical way. Tim: “I think the first thing we need to remember is that TfN isn’t handling the kind of personal data that people are most concerned about. But it is of course imperative that we have the right systems and procedures in place to protect the data we do hold.